PRINCETON, NJ -- Relatively few Americans have a favorable impression of U.S. Senate Majority Leader Harry Reid or Speaker of the U.S. House of Representatives John Boehner -- the two top-ranking members of Congress. But as weak as both men's ratings have been in recent years, Reid's has recently gotten worse, with his favorable score dropping from 27% in April to 21% today. 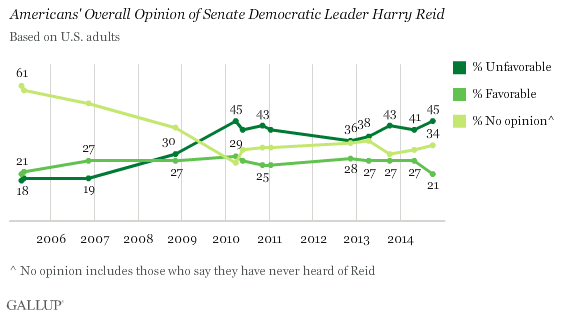 Reid's image has consistently tilted negative since he emerged as a nationally known figure in 2008. Before that, the majority of Americans had either not heard of him, or had no opinion of him. But now his net favorable score (the percentage viewing him favorably minus the percentage viewing him unfavorably) is the worst of his career, at -24. 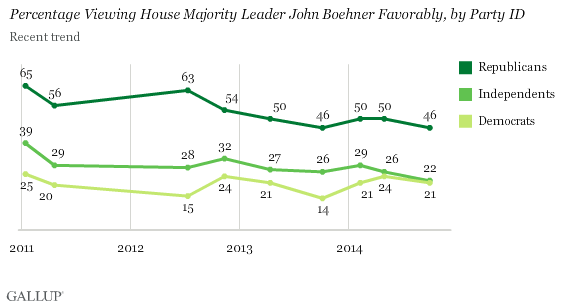 While Reid's image took a hard hit since April, Boehner's rating is down only slightly. Twenty-eight percent of Americans view him favorably, down from 31%, and 50% view him unfavorably. This is roughly equivalent to his ratings since late 2013, but far worse than his image prior to that. The latest results are based on a Gallup telephone survey conducted Sept. 25-30 with 1,252 national adults. Reid's favorable image has dimmed among all party groups since April, although most notably among Democrats, dropping eight percentage points to 46%. Smaller declines occurred among Republicans and independents, reflecting the fact that his scores were already so low among these groups that they didn't have much further to fall. 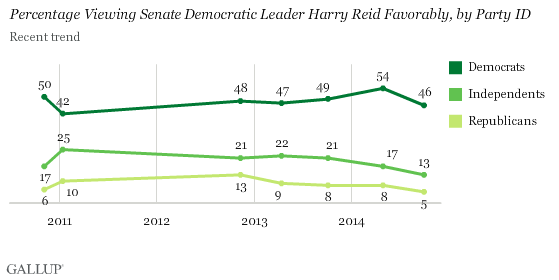 From a longer-term perspective -- at least since 2012 -- Reid's favorable rating has hovered near 50% among Democrats, while it has declined among independents and Republicans. While Reid's favorable ratings are far from stellar, he can at least boast a relatively positive net favorable score among rank-and-file Democrats, as only 16% of Democrats have an unfavorable view of the Democratic leader. 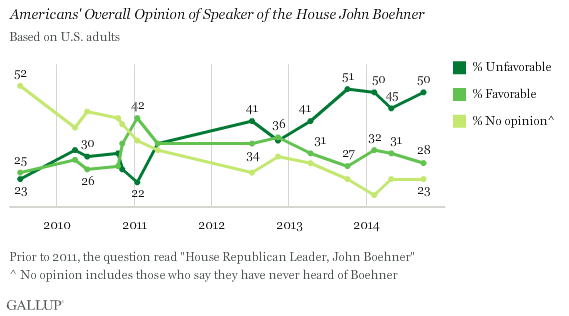 Boehner, by contrast, is in a far worse position with his political base with a full 40% of Republicans viewing him unfavorably, versus 46% viewing him favorably. 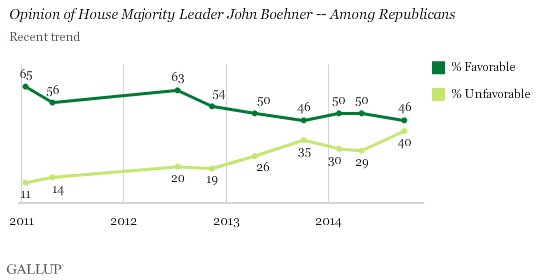 Boehner's image among Republicans started to sour in 2012, along with the broader slide in the Republican Party's image. However, after recovering somewhat earlier this year, his favorability recently got significantly worse, with his unfavorable score among Republicans rising 11 points since April. Boehner's image likely suffered in 2013 from Americans' disaffection with Congress over the budget shutdown, and Republicans' disappointment with the lack of spending cuts in the final budget deal that Boehner supported. His troubles within the GOP this year could stem from the mounting criticism he has faced from conservatives -- including three Tea Party Republicans who challenged Boehner in the primary election in his district this spring -- partly over his support for pursuing comprehensive immigration reform. Like Reid, Boehner has also seen a clear decline in support from independents, with his favorable rating falling to 22% among this group, from 32% in late 2012 -- while his rating among Democrats is largely unchanged, at 21%. As voters prepare to go to the polls in November, neither party's leader in Congress offers his members a positive face with the American public. Boehner's 28% favorable rating is slightly higher than Reid's 21%, but Boehner's unfavorable rating is also slightly higher (50% vs. 45%). Essentially, the situation is a draw -- not significantly disadvantaging either party. Beneath the surface, however, both men appear to have significant problems. While Reid is managing to maintain close to 50% favorability among Democrats, he is becoming far less palatable to independents, a trend that could compel his colleagues who want to repair their party's image with voters after the election to consider their alternatives. Boehner's status with his own party is even worse than Reid's, with nearly as many Republicans viewing him unfavorably as favorably. That could inspire opponents within the GOP caucus to challenge Boehner for the speakership, although overcoming the House rules to mount such a challenge would be daunting.